Thanks for visiting my web site. Just to clear things up this is not a home theatre, its a 'family room' that happens to contain some audio visual gear :) This project started with the addition of our third child Grace; we simply ran out of bed rooms. As all the kids bed rooms are up stairs I needed something to hold the bedroom up, so this family room came into being. Doing an extension to your home does give you a far bit of freedom. My wife (Marg) only had a few requirements that I had to take into account, these where a large family room, no speakers on the floor, no wires visible and one wall of windows (not great for a projector!). 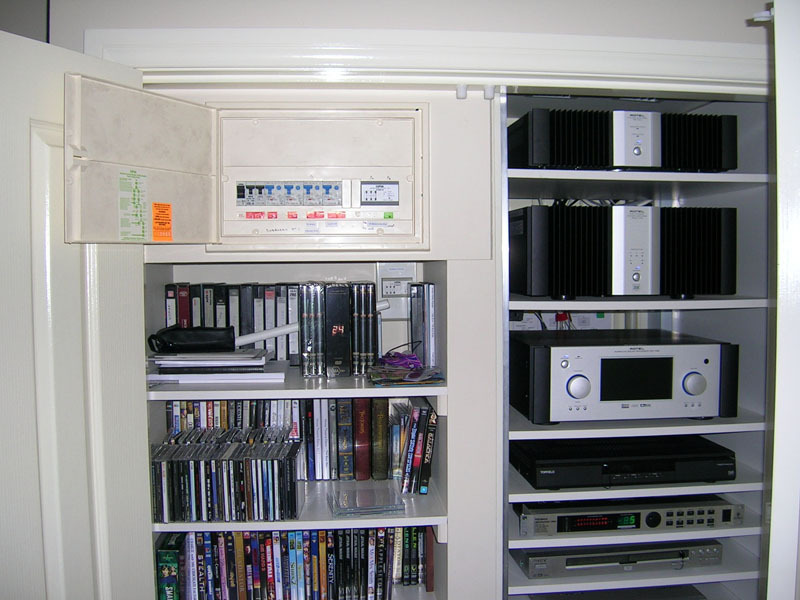 I also wanted a system that was easy to operate and didn't require the kids to turn on amps of processors and select inputs if they simply just wanted to watch a DVD or video on the TV. We where very lucky to have a great people to work with from design through to completion. 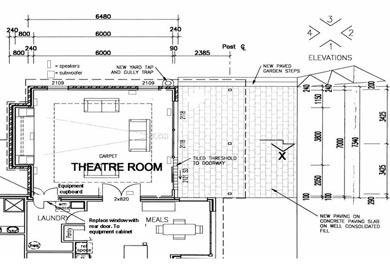 The Plan Centre worked on the design with us, master builder Paul Hickson done an outstanding job in the construction and Jeff Dowley's team from Audio Junction did a great HT installation job. 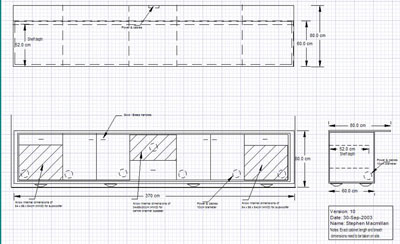 Its very satisfying to do a design then watch it go through construction to completion. 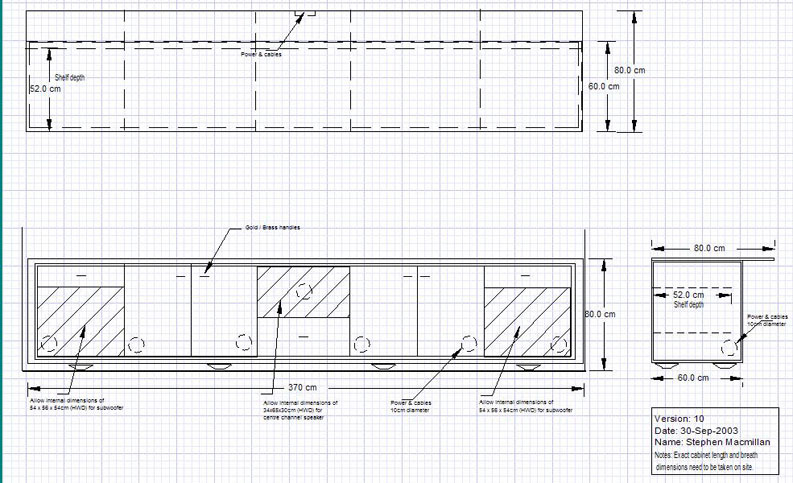 I was initially only planning a 5.1 system, but as the room was being built I realised that 6.5m x 7m x 2.8m is quite large, so I ended up added a pair of rear speakers and a second subwoofer to make it a 7.2 system. As you can see from the equipment list, Rotel provides the sound while an Infocus 5700 shows the image. Living in a PAL country, the 5700 is a great projector as it maps directly to PAL's 576 lines without any scaling producing a stunning image. For speakers I went with a Jamo THX Ultra system, these speakers have great clarity and are wall mounted (except for sub) which satisfied Marg's requirements for no speakers on the floor. These speakers are great for movies as they can go very loud without distortion, the trade off is that they are not so good for music as they have a hard 80hz cut-off as per the THX standard. From that point the 15" & 10" subs takes over. The system is controlled with a Marantz 5200. 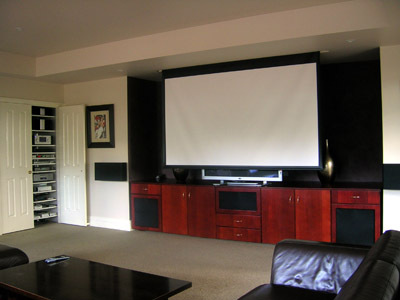 This makes it very simple for Marg and the kids to turn every thing on and watch a movie with the press of one button. 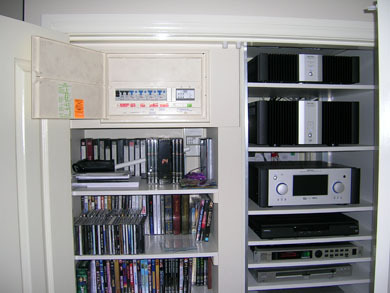 IR extenders are used so that I equipment can be accessed when the cupboard door is closed. To ensure that I didn't have any power issues, the Electrician installed a sub board in the room. This sub board connects directly back to the main power feed for the house. 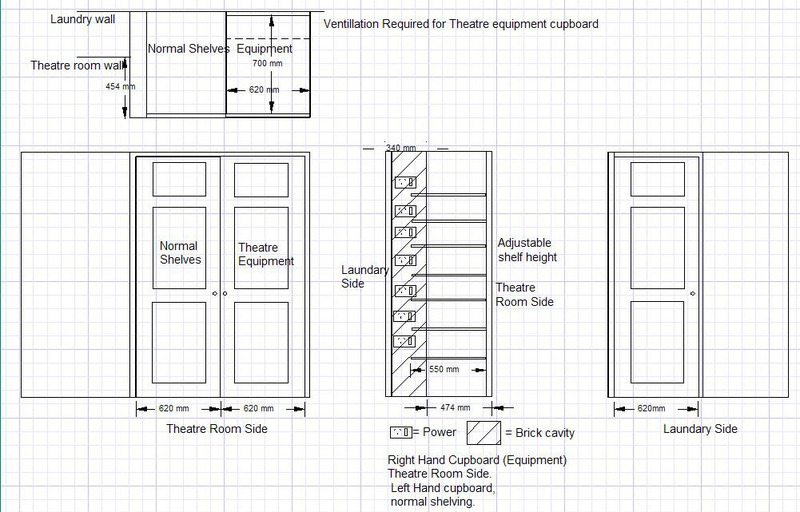 From there, four 20 amp circuits were run, one for the equipment cupboard, one for the Projector / TV and subs, one for the lights and one for the other power points in the room. These all link back to a common ground to ensure no ground loop issues. To provide clean power Clipsal 20amp DIN mounted surge protectors / power filters where installed in the sub board. These are inductor based and are designed to delivery clean power to sensitive equipment. The actual equipment cupboard worked out well as there use to be a window into the laundry where the cupboard is now located, this allowed me to install a door in the laundry to access the cupboard from the rear. This makes changing connects very easy without the need to remove gear. 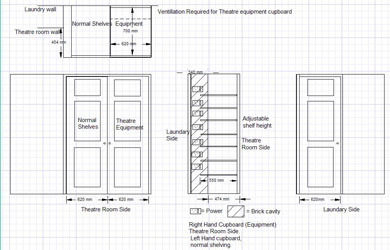 The shelves in the cupboard are also adjustable in height. The power sub board is located in the left had side of the cupboard. I designed this cabinet and had it custom made to hold the two subwoofers, the centre channel speaker and the TV. It really pays to shop around as I took my drawings to a number of joinery's and ended up getting a couple a young guys just starting Bessant's Custom Furniture to build it for half the cost of other quotes I received. Placing subs inside a cabinet can be a bit of a tricky affair. Ensure that the subs are sealed units or at least front ported. Also ensure that the cabinet is well braced. I also have a cement block (45cmx45cmx3cm) on carpet which the sub sits on inside each sub enclosure. This helps isolate the subs from the cabinet and tightens up the bass. 'Blu tack' is also very good to stop and draws or cupboards from rattling. Lining the sub encloses with carpet also help stop an resonance from entering the cabinet. As you can't move the subs around the room to get the best position, a Behringer feedback destroyer is invaluable to remove any room nodes and get good tight bass. For more information on this have a look at my calibration page. Having clean power is very important for a HT system. The main reason for this is to prevent other electrical items such as fridges or lights from causing interference through your speakers or affecting video quality. To prevent this I had the electricians run power directly from the main meter box to a separate subboard then had that split into four dedicated circuits isolated from the rest of the house. As you can see from the next image I've also added power filtering onto the AV circuits. This seems to had the desired effect as I've had no problems with interference from other power sources. 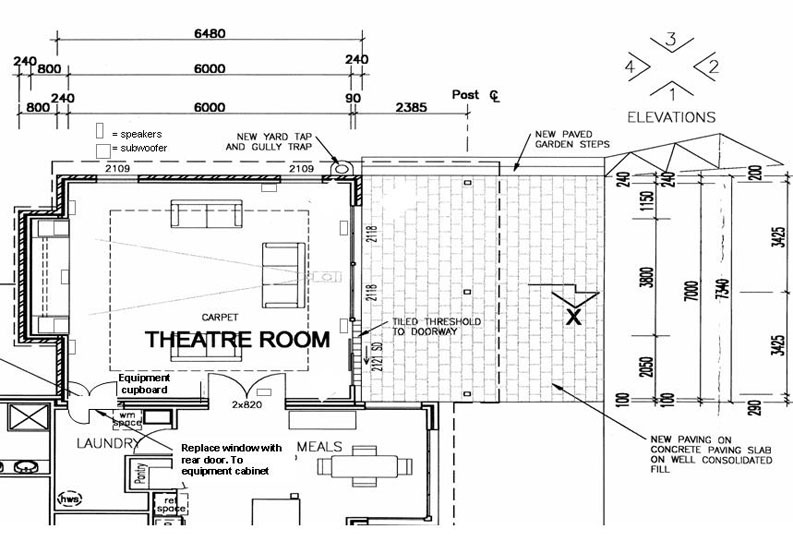 Clipsal 970MF20 - There is a dedicated sub board for this room containing four 20 amp circuits, one for the equipment rack and one for the Projector / TV / Screen. 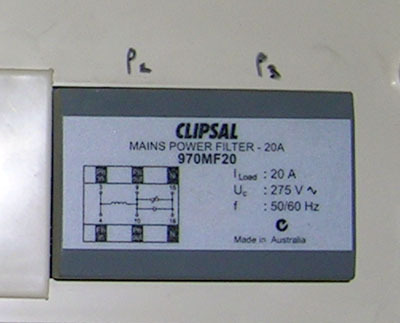 Each circuit has its own Clipsal 970MF20 mains power filter installed. These filters provide surge protection and power filtering. Another two 20 amp circuits are used for the lights and other power outlets in the room. On of the most important lessons I learnt from this was regardless of what cabling you need now, always put in the facility to run additional cabling down the track. Two years after the building was complete we replaced our CRT TV with a Fujitsu plasma. The problem was I had not allowed any facility to run additional cabling (i.e. HDMI). This therefore required me to cut through two brick walls and run ducting along the outside of the house. Luckily the ducting is around the back of the house in the alcove. 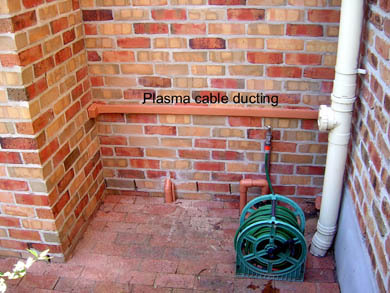 So if you are building, try and run PVC piping through the walls and place a draw wire inside the piping. This will allow you to run additional cabling without having to cut through walls like I had to.